You are currently browsing articles tagged RPCES. 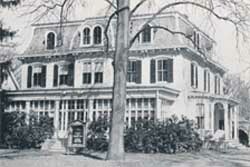 In 1965 the 142nd General Synod of the Reformed Presbyterian Church of North America, General Synod, convened at Covenant College, Lookout Mountain, Tennessee, on April 2. 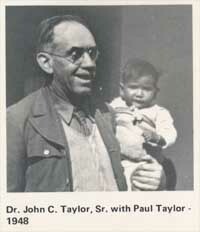 On the same date and place the 29th General Synod of the Evangelical Presbyterian Church was convened. Each of these synods carried on their work until April 6 when the two denominations were united to become the Reformed Presbyterian Church, Evangelical Synod. The uniting service was held at 10:00 a.m. on Tuesday, April 6, 1965, and this service was followed by sessions of the 143rd General Synod of the Reformed Presbyterian Church, Evangelical Synod. The business of the united synods was concluded on April 8, 1965. FOREWORD Three of the liveliest of the smaller Presbyterian Churches in the United States are the children of the action of the General Council of the Presbyterian Church in the U.S.A. in determining to demand in the fall of 1933 that the Independent Board for Presbyterian Foreign Missions be dissolved. Presumably the General Council foresaw that the demand would not be honored. Probably, therefore, it expected to be the father, as it were, of at least one new Presbyterian Church. Whether it counted on triplets is dubious. Its technology was probably not that far advanced. Population control was not a watchword in the early thirties but it has always seemed odd behavior to find the General Council crying loudly for ecumenicity and at the same time requiring the formation of at least one new Presbyterian Church and, in the event, three: the Bible Presbyterian Church, the Evangelical Presbyterian Church (now a part of the Reformed Presbyterian Church, Evangelical Synod), and the Orthodox Presbyterian Church. I’m getting to that (It takes patience to be a Presbyterian! ): The General Synod, or “New Light” RP’s were a denomination that began shrinking in numbers during the last part of the 19th-century and the first part of the 20th. At their low point, there were only nine General Synod churches. 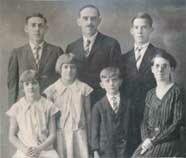 Then, around the 1940’s and 1950’s, with the addition of some new pastors, they began to plant new churches. By the time of that 1965 merger, there were twenty-eight RP, General Synod churches. 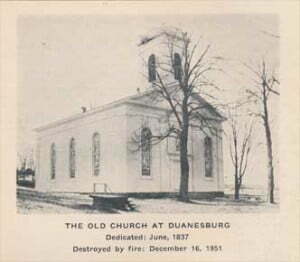 One of their oldest churches was located in Duanesburg, New York. It had been founded in 1795 [and still exists today, as a member congregation of the PCA]. The pastor of the Duanesburg church was one of the older RP pastors. 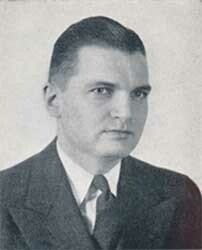 It was he who almost single-handedly held the little denomination together in the first half of the 20th-century, serving as Stated Clerk and editor of a small denominational magazine, The Reformed Presbyterian Advocate. 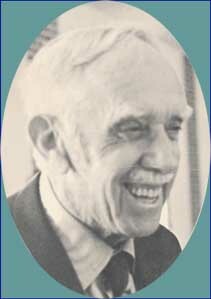 Representatives of the closest conservative Presbyterian Churches – the OPC, the RPCES, the RPCNA, and the PCA – continued formal and informal contacts in the later 1970s. Very few if any substantive differences separated them, although history and personality/style differences remained obstacles and all knew that with negotiated merger plans, “the devil was in the details.” A turning point was reached at Covenant College September 13-14, 1979, when representatives of the four churches’ ecumenical committees met. The PCA, being so young, had actually been urged by some at its General Assembly earlier that year not to consider any merger plan for at least five more years (1984!). When Dr. Edmund Clowney suggested on the first day that a way around this PCA reluctance would be for individual churches or even denominations to simply join the PCA, since it was by far the largest of the four bodies, the idea was seized on by Donald J. MacNair the next day and he made a proposal that the PCA consider extending such invitations in the future. The PCA’s 8th Assembly, meeting in Savannah, GA, voted on June 17, 1980, 525 to 38, to issue those invitations. 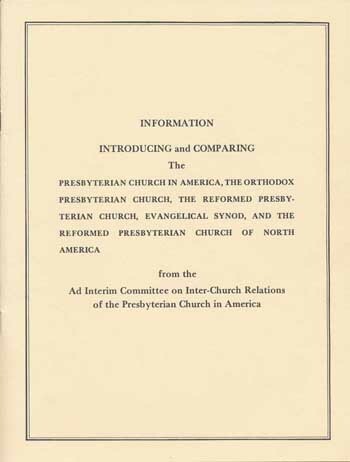 The RPCNA soon dropped out of consideration (their adherence to exclusive psalm-singing in public worship was still too much of an obstacle) and the PCA presbyteries voted by the spring of 1981 not to approve the invitation to the OPC [a narrow decision – 75% of the 25 presbyteries were needed to vote yes; only 18 approved; one of those PCA Presbyteries defeated the invitation by only 2 votes – so it could be said those 2 votes had effectively closed the door to the OPC]. The plan that came to be known as J&R [i.e., Joining & Receiving] was successfully used to enable the churches, leaders, and members of the RPCES to join and be received by the PCA during their overlapping annual meetings in June, 1982, in Grand Rapids, Michigan. The final votes were taken with these results: on June 12th, the RPCES Synod approved J&R by a vote of 322 to 90 (78+% voting in favor). Meanwhile, at some point in the spring of 1982, the point was reached where 75% of the PCA presbyteries had approved the invitation to the RPCES, thus effectively approving the reception of the RPCES. All twenty-five PCA Presbyteries voted in favor of receiving the RPCES, though not unanimously in every case. J&R was officially consummated at the opening of the PCA Assembly in Grand Rapids, June 14, 1982. Someone in seminary once commented that if Presbyterians had a soup, it would be “Split Pea.” That has been the sad commentary for far too long. Of course, we are not talking about just occasions when, with respect to apostate Presbyterianism, it was better for the sake of the gospel and our children, to let our feet do the voting and leave. But when Bible-believing Presbyterians cannot join together for reasons far inferior to the truths of the gospel, then there is an occasion to weep. Let us pray for biblical union of all far-flung Presbyterian bodies. Let us work for biblical union of our “split peas.” And then let us come with a united biblical witness before an increasing secular society. Pictured at left, one of three booklets issued in conjunction with the Joining and Receiving effort. In May, 1861, the General Assembly of the Presbyterian Church in the United States of America (Old School), which met in Philadelphia, adopted a paper in reference to the Civil War, which begun the month before. This paper became known as the Spring Resolutions, after the Rev. 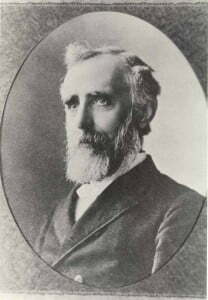 Gardiner Spring, pastor of the Brick Church in New York and the minister who brought these resolutions to the floor of that General Assembly. Three times these resolutions were put before the Assembly, and twice they failed of vote, but with some changes, passed on the third presentation. With the adoption of the Spring Resolutions, the Assembly undertook to decide for its whole constituency, North and South, a question upon which the most eminent statesmen had been divided in opinion from the time of the formation of the Constitution, namely, whether the ultimate sovereignty, the jus summi imperii, resided in the people as a mass, or in the people as they were originally formed into colonies and afterward into States. Presbyterians in the South believed that this deliverance, whether true or otherwise, was one which the Church was not authorized to make, and that, in so doing, she had transcended her sphere and usurped the duties of the state. Their views upon this subject found expression in a quarter which relieves them of all suspicion of coming from an interested party. A protest against this action was presented by the venerable Charles Hodge, D.D., of Princeton Theological Seminary, and fifty-seven others who were members of that Assembly. Presbyterians in the South, coinciding in this view of the case, concluded that a separation from the General Assembly aforesaid was imperatively demanded, not in the spirit of schism, but for the sake of peace, and for the protection of the liberty with which Christ had made them free. After the adoption of the Gardiner Spring Resolutions in May of 1861, Presbytery after Presbytery in the Southern States, feeling that by that act they had been exscinded, withdrew from the jurisdiction of the Assembly that had transcended its sphere and decided political questions. A conference of ministers and elders was held in Atlanta on August 15-17, 1861, and in response to a call thus issued the Assembly met. Accordingly, ninety-three ministers and ruling elders, representing forty-seven Presbyteries, duly commissioned for that purpose, met in the city of Augusta, Georgia, on the 4th of December, 1861, and integrated in one body. The first act after the organization of that memorable Assembly was to designate a name for the now separated Church, and to declare its form and belief. The North/South division of the Old School Presbyterians did not happen in an historical vacuum. That brief comment above, “…feeling that by that act they had been exscinded,…” is an intriguing key. Could it be that the division of 1861 happened in part because of the division of 1837? 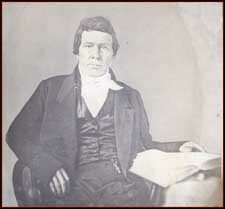 In the division of 1837, the Old School Presbyterians unwittingly established a precedent when they exscinded four Synods which were predominantly New School. In making this observation, I am not arguing that they were right or wrong, but simply that ideas and actions have consequences. The overt exclusion of four Synods in 1837 was still a recent memory in 1861, and in that light it seems a more reasonable suspicion that now it was the Southern churches which were being excluded, whether overtly or not. Our actions have consequences. Once you do something, it becomes easier to repeat that action. This is how habits are formed. This is how we learn. And this can be either good or bad. On the positive side of things, skills and abilities can be tuned to a fine pitch; all manner of tasks can be mastered. But, by allowing a first transgression, we can also become quite adept at sin. Instead, let us fear God and hate evil. Like Joseph, turn from sin at its first appearance, and run! Or, to return to our story, imagine how things might have turned out, had that first slave ship been refused access to our shores? What sort of nation would we be if a different precedent had been set from the start? We can’t undo history, but we can find forgiveness and mercy in Christ as our Lord and Savior.